East side of Spruce Street from the 8th Street corner looking south, early 1930s. Photo shot after the Bank of Italy changed its name to Bank of America in 1930, and before Spruce Street was widened in 1935. The county of Los Angeles changed the name of this section of Spruce Street to San Fernando Road in the 1950s and changed all of the street addresses from three digits to five. The city of Santa Clarita changed the name of this section of San Fernando Road to Main Street in 2007 but kept the county's street numbering system. The current address of the old Bank of America building is 24338 Main Street. It started as Bank of Italy in this location. About 1958, BofA moved across the street to the northeast corner of 8th and San Fernando. Later tenants at this original BofA location (24338 Main Street) included Newhall Shoe Store (1960s), Sound Unlimited (car stereos) and Sportsman Supply (a bait and tackle shop). The building was later used by Tresierras Market for storage, and as of 2013, it is listed for sale. Los Angeles County Assessor records show a (re)construction date of 1971, possibly related to the Feb. 9 earthquake. Bank of America's new (1958) location at the northeast corner, not seen in this photograph, has a current address of 24346 Main Street. Assessor records show construction dates of 1948 and 1958. The 1948 date is confusing because a 1949 photograph clearly shows it as a vacant parking lot. As of 2013, New Life In His Presence Church occupies the same building at 24346 Main Street that BofA occupied after 1958. Next to BofA in this photograph is H.W. Bricker's general store. It started life in 1878 (at this location) as Campton's general store — although prior to 1914, it pointed the other direction, facing Railroad Avenue. After the 1935 widening, Bricker's became People's Market. Then it became Chitwood's Furniture Store No. 2 (store No. 1 was down the street at the future home of the Canyon Theatre Guild), and then Hilburn Funeral Home. The building burned to the ground in 1961. As of 2013, the ex-Campton site is the location of Abe's Newhall Pawn Shop and the store next door (immediately south of Abe's). Then comes a "Feed and Fuel" store — a conversion and expansion of the feed store that was attached to the south side of Campton's — which, in the early 21st Century, is a portion of Jazmin's Bakery. Next comes the location of William Mayhue's house. Can't tell if it's still there, in this photograph. He moved his house to Chestnut Street (probably Chestnut and 9th) to make way for the 1935 street widening. 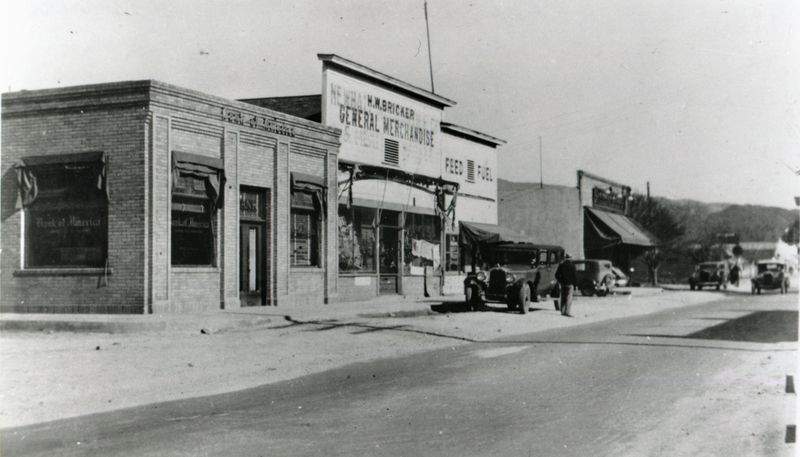 In 1947, Don Guglielmino opened Newhall Hardware on Mayhue's former house site. The market at far right in this photograph was already Safeway. Safeway moved out in 1965 (to the brand-new Old Orchard Shopping Center in Valencia), and this location became the second Dillenbeck market for a short time. It then became Tresierras Market. Read this 1935 news story to get an idea of what was where in 1935, and what moved to accommodate the street widening. AP0735: 19200 dpi jpeg from copy print | Same as AP1517.